Severe psychological distress in palliative care patients is not uncommonly encountered by healthcare professionals. It is a manifestation of suffering requiring appropriate intervention, every bit as important as unrelieved pain or nausea. Such distress may range from transient “normal” sadness and grief to more disturbed psychological states such as severe anxiety, depression, demoralization, manifestations of serious mental illness, decompensation of personality disorder, and post-trauma syndromes. At times, the underlying cause may be organic – a reaction to corticosteroids, manifestations of cerebral pathology, or delirium. 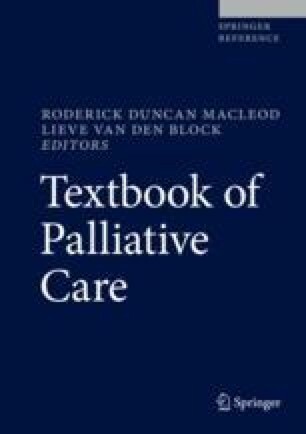 The first section of this chapter focuses on how the clinician can recognize and distinguish different forms of psychological and psychiatric disorder which manifest as distress in palliative care patients. The discriminating features are presented in comparative tables and highlighted by clinical cases. One case is described in detail at the end of this section, where the patient suffered severe distress from different clinical syndromes over the last 8 months of his life, illustrating the need for continuing vigilance and assessment. The second section introduces therapeutic responses to patients in severe distress that every clinician can develop to reduce suffering in the moment. In so doing, the need for “emergency management” of clinical scenarios can be reduced and treatment can pave the way for specialist intervention when required. It describes the various therapies which have a demonstrated evidence base for efficacy in this population and summarizes in table form the recommended approaches for easing suffering in different forms of distress. Akechi T, Okuyama T, Onishi J, Morita T, Furukawa TA. Psychotherapy for depression among incurable cancer patients. Cochrane Libr [Internet]. 2008. https://doi.org/10.1002/14651858.CD005537.pub2. Alam A, Voronovich Z, Carley JA. A review of therapeutic uses of mirtazapine in psychiatric and medical conditions. Prim Care Companion CNS Disord [Internet]. 2013;15(5). https://doi.org/10.4088/PCC.13r01525.